Unless something goes horribly wrong, this will be my final Festbier review of the year, the omega of Märzen analyses, if you will. Yes, Oktoberfest inspections are on the way out. Because this year's crop of Wisconsin Oktoberfests was, for the most part, cringeworthy – the ones I tasted, anyway – I am hoping to end on a high note. And so I look to foreign brewers to get the job done right. To begin I am going to heed Horace Greeley's imperative and taste Märzen by Denver's Prost Brewing. Considering that Prost brews German bier styles exclusively, one would think that their Oktoberfest would be preternaturally tasty. So far, I've found their biers to range from mediocre to very good. So, while perhaps not a shoo-in, I certainly expected this to be a really good bier. Things began well enough as I discovered its golden hue, tinged – but only just – with amber. Certainly this would not be laced with caramel/crystal malt sweetness. Clear as day, I could see surfeit of bubbles inside. Alas, they made their way upwards to an imaginary head. D'oh! The aroma was light toffee, bread, and some apricot. It was sweeter than I expected, yet it was not cloying with the bready scent more than holding its own. If I had any worries about the aroma being a portent of things to come in the taste, I needn't have had them. Märzen came replete with Maillardy goodness, full of toasty bread taste. Just wonderful. 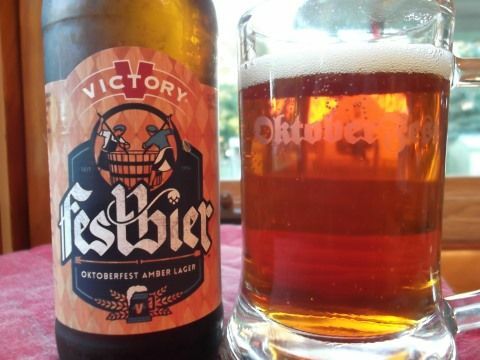 It also had that nutty taste I first encountered with Victory Festbier, though less strong. Other less toasty bread flavors were joined by some great hops that were grassy tasting at first but took on a really nice flavor upon closer inspection. I did, however, find it a bit over-carbonated. Witness all those bubbles I saw. Those hops took on some spiciness at the finish and added moderate doses of bitterness and dryness to drive away the last of the malty residue. Of Schaumhaftvermoegen there was none. While it suffered from a touch too much carbonation and was thusly was a little acidic, this was a very good brew. It was nice'n'Maillardy and had very little sweetness. I really enjoyed the hops, especially the floral taste. We now leave the Rocky Mountains and head to the bayous of Louisiana and Abita Brewing. Well, I am not sure that Covington is even near a boyou, truth be told. Still, the brewery likes to trade on bayou imagery, especially gators. Perhaps only gators. I don't recall ever seeing an airboat on one of their bottles. One thing I don't associate with the creole culture in Louisiana is a German influence. I think of Native American, French, African, and Spanish but not German. But there was apparently a "German Coast" in the state's early days on the east bank of the Mississippi River. That Wikipedia article also notes, "During World War I, in a reaction against Germany as the enemy, the Louisiana state legislature passed Act 114: it prohibited all expressions of German culture and heritage, especially the printed or spoken use of the German language, in the state." Yikes! So let's taste Abita's expression of German culture and heritage. I begin by noting the bier's medium gold color. A good beginning as this bodes well for minimal sweetness. Clear? Check. For a change of pace I managed to pour a big head. The foam was white and loose and lasted 30 seconds or so. This was an effervescent bier with lots of bubbles inside. Rather than caramel sweetness, my nose first caught the scent of some fresh grassy hops. Unexpected though not unwelcome. That caramel was there but tucked away in the back while a more bready smell was at the fore. The same held with the taste. A rich bread/biscuit flavor held sway and relegated a touch of malt sweetness to a supporting role. The hops were firm but not overpowering and they had a tasty combination of grass and spiciness. While the Prost had a bit too much carbonation, here it was just right. Those hops were let loose on the finish after the malt faded or was, perhaps, pushed out. They were pretty spicy – nearing minty territory – and made for a rather dry denouement, though not especially bitter. The Schaumhaftvermoegen was great with webbing everywhere inside my glass. As someone who hadn't had many Abita beers prior to this one and with the ones I did have being all fruited beers, I wasn't really sure what to expect from them doing a traditional lager. I am happy to say that this was a really good Oktoberfest. It had a nice bread flavor, though not of the Maillard toasty variety, but tasty nonetheless. And the sweetness was minimized. Those spicy hops on the finish were a pleasant surprise too. I find that spicy hops clash with sweeter malts in an unpleasant way but here, with bready flavors, they were a wonderful complement. Junk food pairing: Pair Abita Oktoberfest with a bag of Snyder's Peanut Butter filled Pretzel Pieces. Watching Hell or High Water I noticed that Jeff Bridges character drank Shiner Bock in almost, if not every, scene in which he drinks a beer. Now I don't know if this was because the Shiner folks paid the filmmakers or if the filmmakers simply like the beer. Or perhaps a preference for craft beer is supposed to be a commentary on the otherwise gruff old-timer with a penchant for racial humor of a decidedly non-politically correct type. I suppose I was expecting to see cans of Lone Star. I don't think I've ever reviewed a Shiner beer. Shiner is a brand brewed in the town of the same name in Texas between San Antonio and Houston. And it is brewed by the Spoetzl Brewery, named after Kosmos Spoetzl, a German immigrant and the brewery's first brewmaster and owner. A fair number of German immigrants settled in Texas although I tend to associate the state with things like oil, steak, chili, and Tejano music. Then again, Lone Star was founded by at least one German immigrant. We're talking lagers here, a technique surely brought to Texas by Germans. And so while surely a minority culture, that of German immigrants left its mark. Ooh. 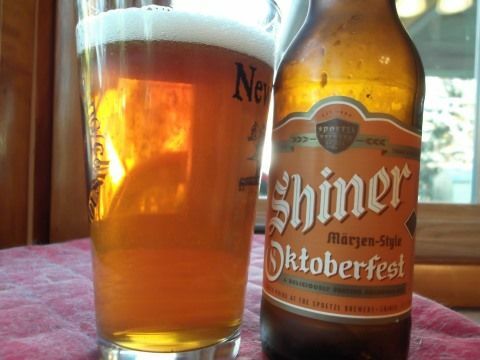 Shiner Oktoberfest pours an amber hue. We could be headed for caramel sweetness. The bier's clarity revealed a generous amount of bubbles floating upwards to a sizable loose, white head. Sweet or not, it sure looked pretty. Yep. Sweet caramel(ine) was out front on the nose trailed by some bread and a nice herbal hoppiness. Things aren't going too well here. While I could certainly taste caramel, I was relieved to also taste bread and roasted grains to keep the sweetness from dominating. There was a nice fizziness to it as well as some very tasty hops that were grassy and spicy. A little of the sweetness lingered towards the end as the hops became stronger and took on some black pepper taste. The finale was quite dry and bitter, eventually washing away all trace of malt. Schaumhaftvermoegen was limited to a smattering of foamy spots with a few small patches. All things considered, I quite liked Shiner's Oktoberfest. It ended up not being quite as sweet as the color would have you believe. Plus the bread and grain flavors were quite tasty even if they weren't toasty in a Maillard kind of way. The bier finished more like a Bohemian pilsener than a Märzen but the sprightly hop taste made for a nice, bracing libatious experience. Junk food pairing: Shiner Oktoberfest pairs well with sharp cheddar cheese food products like Velveeta and Easy Cheese so dip a soft pretzel in some melted Velveeta dip or pointed your aerosol can in its direction. I guess my previous post won't quite be my last review of a Wisconsin Oktoberfest. 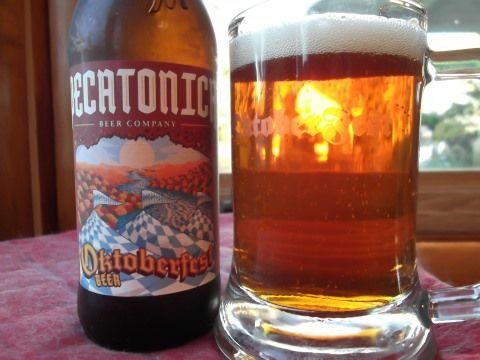 The Pecatonica Beer Company is apparently domiciled in Gratiot, Wisconsin in the southwest part of the state. The company's tied house, the Pecatonica Beer Company Tap House, however, resides south of Gratiot on Highway 78 and across the Cheddar Curtain in Warren, Illinois which is within spitting distance of the Wisconsin-Illinois border. I would have included this bier in a Wisconsin Oktoberfest round-up but I was under the impression that the company itself was headquartered in Illinois with the suds being brewed in Wisconsin. Ooops. Pecatonica's beer is brewed in Monroevia (as my Croatian-American friend who lives there calls it) at the Minhas Craft Brewery. Minhas does not exactly enjoy a good reputation as a microbrewery yet it was #9 (#9, #9, #9) in a 2015 ranking of largest craft breweries by volume. The Wisconsin State Journal's Beer Baron confessed that he finds "a lot of the beer produced by Minhas has a Corn Pops-type flavor". I personally haven't noticed this but did find that every beer in their Lazy Mutt sampler pack tasted A) thin & watery and B) barely distinguishable from one another. I will admit that those bombers of Rhinelander stout are plenty fine, especially for the price. As for Pecatonica, I have had their Nightfall Lager. The dark lager is one of my favorite styles and so I upbeat at the prospect of another one appearing on store shelves. Unfortunately, the few times I've had it – on tap – it has been a syrupy, ill-attenuated mess. Did a perfectly delectable barrel leave Minhas only to become sullied somewhere along the way each time? It is certainly possible. Wherever the blame lies, I have avoided Pecatonica since. Well, until recently. There was a lot more caramel to be smelled than the bier's color let on. Usually big sweetness is accompanied by a darker hue. Sneaky. Some nice grassy hops and a nebulous, berry-like fruit scent rounded things out for my nose. I was thoroughly unsurprised to find that the taste was dominated by caramel sweetness. I can only imagine what it would have been like if there wasn't nice, firm carbonation and a tasty bit of black pepper as well to put down the sweetness rebellion. Shades of bread and banana rounded out the taste. Grassy/spicy hops bid the malt auf wiedersehen leaving things in a pretty dry and bitter state. There was also an astringent chemical taste that I couldn't identify. Of Schaumhaftvermoegen there was not a trace. Talk about going out with a whimper. 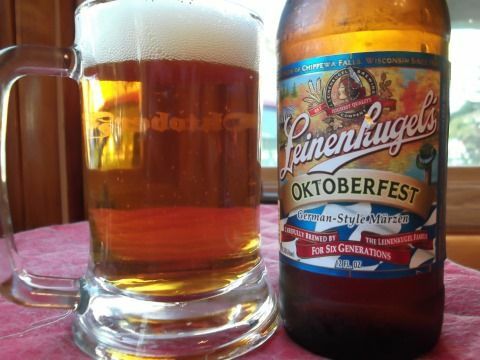 Octoberfest has been the cruelest style for Wisconsin brewers this year. I am tempted to find another local Festbier just to end this year's batch on a high note instead of this. Knowing next to nothing about the actual details of how Pecatonica's beers are made nor what trials and tribulations my bottle may have undergone prior to being in my clutches, I don't know on whose shoulders this mess belongs. On the one hand, the paucity of bready tastes as opposed to sweet, toffee ones is not a sin belonging to Pecatonica alone. On the other hand, the banana and chemical tastes are as is the lack of a nice lagery crispness. The tastes just don't harmonize here; instead it is as if they are at loggerheads all the time. Junk food pairing: Go for the cheesy overload and pair your Pecatonica Oktoberfest with some Snyder's Cheddar Cheese Pretzel Sandwiches dipped in a fine cheese food product dip. 2016 marks the 30th anniversary of Capital Brewery, well, brewing. The company itself came into existence in 1984 but brewing didn't commence for a couple of years. To celebrate, the brewery whipped a few special biers: Munich Dark infused with coffee and vanilla, an imperial pilsner, a pear Kölsch, and, most recently, a spiced Oktoberfest. Capital also released Madtown Mule, their Lakehouse Lager infused with ginger and lime juice, but I don't know if this was in honor of the 30th anniversary or not. Similarly, there have been various barrel aged offering but, again, I am unsure if they are anniversary one-offs or just part of their nascent barrel aging program. What is striking to me is how little fanfare was made of the anniversary. Maybe the brewery really whooped it up on social media that I do not frequent – I am certainly willing to concede that. But I doubt it. None of the anniversary biers were bottled and I don't recall the brewery actually throwing an anniversary bash. Did I miss it? Go to the Capital website and try to find any mention of these celebratory biers. When Grateful Red, their red IPA, was released, Madison buses were wrapped in adverts for it. For special anniversary one-off lagers, it's good luck finding them on tap. Sad. Growlers to Go-Go recently tapped a barrel of the Munich Dark infused with coffee and vanilla. Considering that the bier was released in the spring, this was probably not the freshest bier. But it's not about hops and was presumably stored nice and cool so, while perhaps not optimal, I saw no reason not to give it a try. The bier was a dark copper color and quite clear. While there was a good amount of bubbles inside the glass, up top there was no head. This was likely due to my poor pouring ability and the fact that this was day two of the brew sitting in my growler. Taking a whiff, I found that vanilla was up front with the coffee just behind it. And they smelled really nice and rich. Taking a sip, I found that the vanilla was still right up there but that the coffee had become a little stronger. And so, in addition to a great coffee taste, there was also some bitter chocolate to be had. The dunkel seeped through as well as I was able to taste some roasted grains. In addition to flavor, the coffee also added some bitterness which mingled with the hops that gave a grassy/spicy taste and moderate bitterness of their own. The coffee and vanilla lingered pleasantly on the finish while the hops reached a spicy crescendo. But not too spicy. Just enough to give some bitterness and end on a mildly dry note. Schaumhaftvermoegen was nowhere to be found. This bier was ausgezeichnet! The coffee and vanilla combination was just great. I suppose they go well together since they have complementary earthy flavors. But the vanilla adds a little sweetness while the coffee contributes bitterness. While these infusions are the stars of the show, I could still taste the roasted grain of the clean, crisp dunkel beneath. This should have been bottled and given a wider release. 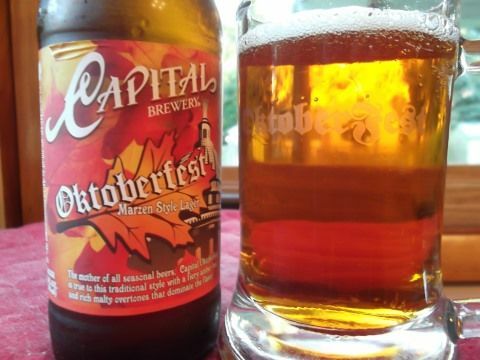 Not only is it an extremely tasty brew but Capital, as the alpha of Madison area craft brewing, deserves to have their anniversary celebrated better. Junk food pairing: Pair your 30th anniversary dunkel with something that complements the infusions like some Snyder's Dark Chocolate Pretzel Dips. Today will be my terminal tasting of Oktoberfests from Wisconsin breweries. By and large this year's crop has been disappointing. Words like "full" and "rich" were sadly inapplicable to most of these biers. At least one was laden with diacetyl – a big disappointment. But most were simply one dimensional, thin and watery with a touch of caramel sweetness and perhaps some hops. There were, of course, many more homegrown Oktoberfests that I haven't tried than those that have crossed my lips. Amongst bottled brews are New Glarus, Ale Asylum, and Sprecher. Add to that those from brewpubs and I'm sure you've got quite a total. I'm no statistician so I am not sure if 12-14 samples is representative enough of Wisconsin Okto-output to render a valid verdict for 2016. But as far as my tongue is concerned this year was simply disheartening. I'd like to be able to just put this episode behind me and wait for Wisconsin to shine with its Weihnachtsbiers but we don't really brew many of those. What is my state's preferred winter seasonal? First up is the venerable Jacob Leinenkugel Brewing Company. I wrote about the special place in my heart for Leine's not too long ago. Having said this, their output is uneven. They brew some fine beers but they also brew liquids that are almost, but not quite, entirely unlike the style listed on the bottle. It's like they're starter beers. They get you into the ballpark of what the style is about without ever going all in. Will the same fate befall Oktoberfest? It poured a deep gold which was something of a relief as I figured it wouldn't be overly sweet. Clear as day, I could see a fair number of bubbles rushing upwards to a big, frothy, white head that decided to stick around for a while. As expected, my nose caught a bready smell first. It was joined by some tasty grassy hops. Sure, there was some caramel sweetness but, as the color foretold, it was rather mild. And really, overall, the aroma was pretty tame. Not bad, but certainly not an olfactory fanfare. The taste was mostly more of the same. A restrained bread/biscuit maltiness bolstered by a touch of caramel sweetness. While the hops were grassy on my nose, they pulled a Jekyll and Hyde routine and took on a sharp herbal/spiciness on my tongue. Add in just the right amount of carbonation and you've got a nice little bit of zing going. The malt fades at the end leaving that zesty hop flavor to come forward for a rather dry and bitter finish. My glass was left with some scattered patches of Schaumhaftvermoegen. Leine's Oktoberfest was just about what I expected it to be – a Virginia Slims beer. It's got all of the Oktoberfest components but not enough of most of them. More malt flavor was needed in place of the hints of bread and biscuit here. I will admit, however, that I really like the hoppiness. Grassy to the nose but spicier on the tongue with a little bite. Really nice. Junk food pairing: Pair Leine's Oktoberfest with something simple like potato chips and a bacon & horseradish dip. This is really more of an addendum as the Old Style brand is, to the best of my knowledge, still owned by Pabst which is, in turn, owned by a "beer entrepreneur named Eugene Kashper and a private equity firm based in San Francisco. According to Wikipedia, anyway. And so, while Old Style is not a Wisconsin company, it is being brewed in La Crosse again at City Brewery, the former of of G. Heileman. Old Style was very popular in Chicago when I was growing up there and when my friends and I would steal beer from our fathers' stashes, it was usually Old Style. (And sometimes Special Export or Hamms.) I don't have an affinity for the beer or the brand because of this but Old Style has a long history in Wisconsin and I think it fits the theme here, if only tangentially. Having said this, I see that the Old Style website plays up its (former?) popularity in Chicago heavily. "Chicago's beer" is everywhere. Oh well. Alia iacta est. 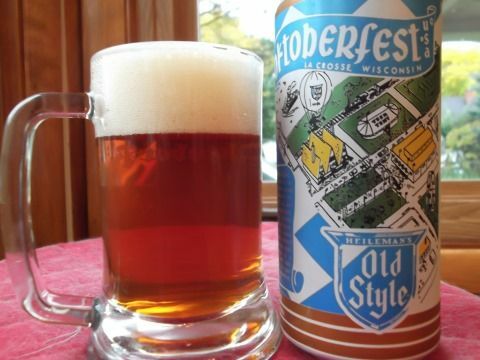 I haven't found any indication that Old Style used to brew an Oktoberfest while it was still brewed in La Crosse back in the day although G. Heileman may have under a different label. As with the Leine's Oktoberfest, I didn't go into this with great expectations. 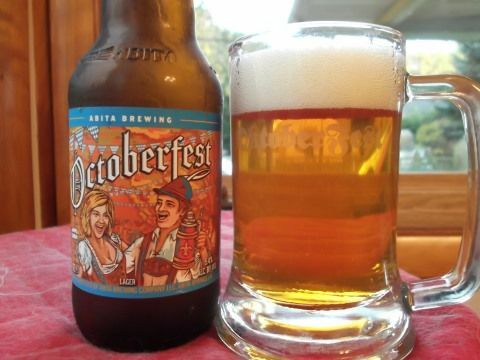 Old Style's Oktoberfest was amber in color which augured a sweeter bier. It was clear and, against all odds, I managed to pour a bier with a nice head. This was was firm and off-white and, happily, it lasted a while. There was a modicum of bubbles inside. 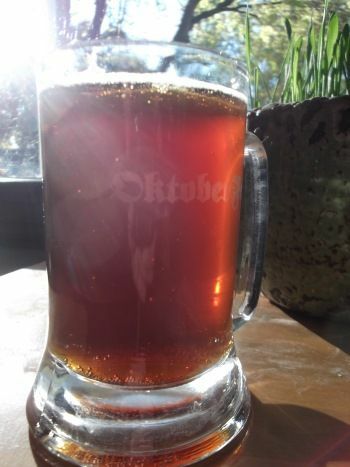 As was forewarned by the color, Oktoberfest had a not insignificant caramel sweetness to it that managed to somehow not lapse into being cloying. There was a little biscuit flavor as well as a healthy dose of peppery hops. The carbonation fell into the optimal range. And there was also this nebulous earthy/spicy flavor. The best way I can describe it is that it was as if they were going for that peppery flavor you find in some amber lagers such as Eliot Ness but couldn't quite get there. It wasn't unpleasant, really, it just malformed or perhaps undercooked. For the finish the malt bid farewell leaving some peppery hops to do their thing. Here that meant a fairly firm dryness and attendant bitterness. Along the lines of a German pils, I'd say. Schaumhaftvermoegen was everywhere with streaks all around my glass. With a medium body Old Style's Oktoberfest had a bit more heft than Leine's but this is purely because of the additional sweetness. What both biers had in common was a real lack of maltiness – especially the kind that doesn't taste like caramel. They were both thin and in need of more of a grainy foundation. The peppery hops in the Old Style were a pleasant surprise but they required more malt to play against. Sadly, these Oktoberfests by larger, maybe less crafty, brewers are very much in line with those brewed by smaller, craftier ones. Junk food pairing: Pair your Old Style Oktoberfest with some Doritos dipped in a vat of warm, gooey Velveeta cheese food product. Oooh! My first rauchbier of the autumn. I believe that it is also my first Dark Horse review. I've had a collaboration brew with which they were involved and have sampled their wares at the Great Taste but I can't find any evidence that I've blessed them with a solo inspection of one of their beers. Dark Horse hails from Marshall, Michigan – a town about the size of Portage that lies in the south central part of the lower bit of the state. I don't really know why but I always think that the brewery is in California or Colorado when I see their six packs in the cooler. And they're almost always seated next to Short's, Bell's, Founders, and whole lot of other establishments that lie east of the Mississippi so you'd think I'd get the hint. But no. Honestly, I don't know much about Dark Horse. I presume they brew lots of IPAs because that's what breweries do to placate all those tongues wagging in Citra-fueled paroxysm. Fore Smoked Stout is the fourth entry in their Stout Series so apparently they also have a thing for stouts in addition to hoppier beers. Fore can rightly be described as Stygian in appearance. Pouring it, the beer looked to have the color and viscosity of motor oil. Sure, it's deep brown but looking at the glass like any normal person does, it is black. It may have been clear but I couldn't say for sure. I can tell you, however, that I didn't see any flakes or chunks. As per normal, I managed only a small head here. The foam was moved beyond the realm of tan into brown, albeit one of a lighter hue. Sadly it went away rather quickly. The effervescence you ask? Stygian, I say, Stygian! As a lover of smoke beers, I find trying a new one to be exciting because I get to find out how far a brewer is willing to go/keen on going. Are they going to throw in a just a little smoked malt simply to add to the gustatory milieu and appease a wide audience or will they use a more generous helping to emphasize the smoky taste to appeal to the hearty few? I can usually tell by waving my beer around to look at the color and whatnot because a fairly smoky beer is discernible even when it is a foot or more away from your nose. If there's a Schlekerla even 30 cm away, you'll know it. Fore is not one of those beers. Bitter chocolate was most pronounced to my proboscis with the smoke having a definite supporting role. And no, it didn't smell like bacon. Nor of apple wood. Perhaps it was oak smoked. There was also a firm sweetness which reminded me of the Chinese haw flakes I ate as a kid. While I am sure the history of the stout is quite lengthy and convoluted, I simply think of them as, well strong porters. Fore certainly fits that description with a lot of dark/bitter chocolate taste that was bedecked with a hint of coffee and, of course, some (non-porcine tasting) smoke. Some spicy hops added a touch of bitterness but it was really the black malts that gave that acerbic taste. A bitter chocolate aftertaste lingered long after the last drop had descended into my gullet and was joined by the hops which became a little grassy here. This was by no means a very hoppy beer but they let your tongue know they were there. And, when the carbonation joined, it was more than a little dry. I also noticed a slight alcohol burn. Fore is only 7% but you can taste it. There wasn't much lacing here – just some small spots here and there. Dark Horse definitely took the smoke-as-an-accent route. It doesn't jump out at you and instead has a good ol' time blending with the coffee and bitter chocolate maltiness. Fore has a definite ashen black malt taste and it is bitter. But in a good way. 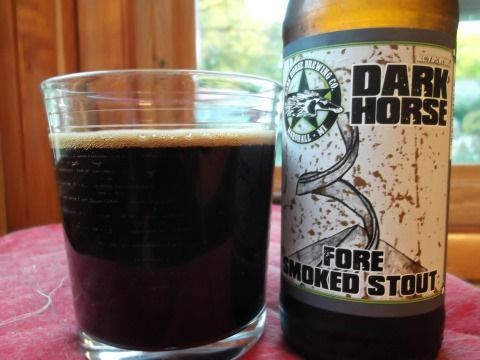 While I wish there was more smoke flavor – I always wish there was more smoke flavor – Fore is a really tasty combination of dark and smoked malts. It's also on the big side with a heavy-medium body and some alcohol burn. Still, I found that it went down quite smoothly. Junk food pairing: Pair Fore Smoked Stout with some Smoked Gouda Triscuits smothered in American Flavor Easy Cheese. I am taking a break from the Oktoberfest madness before I polish off the remaining ones in my cellar. It's like a 7th inning stretch. Besides, there is a cornucopia of non-Märzen beers out there to enjoy. 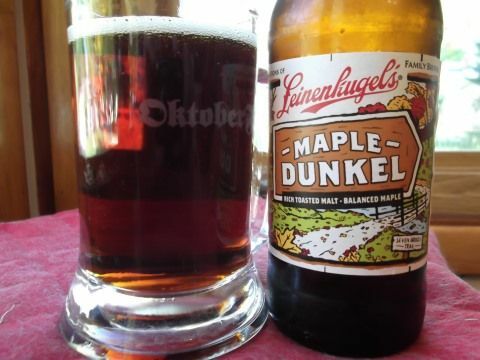 One that tried recently was Leinenkukgel's Maple Dunkel. The bier is available only as part of their Autumn Explorer Pack. Well, unless the liquor store you frequent busts the packs open to sell as singles. I was ambivalent about it going in. On the one hand, another of their newish seasonals, Snowdrift Vanilla Porter was simply disgusting to my palate and exemplifies how flavorings bring out the worst in the brewery. On the other, this year's Spring Explorer Pack brought Heart of Oak, an oak aged Vienna lager which was excellent. But I like dunkels, I like maple syrup. Either this bier would be a cloying train wreck or another justification for my sentimental love of the brewery despite it being a subsidiary of the Omni Corp of brewing. Having lived up by Eau Claire for a stretch, Leine's has a special place in my heart. It was something of a hometown brewery during the interregnum between the closing of Hibernia and the opening of the Northwoods Brewpub, circa 1997, which was the next brewery to set up shop in Eau Claire, during which many old duffs bemoaned the loss of Walters at taverns across the area. During my college days when money was tight, Leinekugel's (Original) was a welcome respite from countless half-barrels of Old Milwaukee. After college, when money was tight, I couldn't afford to drink Sprecher all day at Summerfest and so I quaffed many a Leine's Honey Weiss. And so despite having sold out to Miller in 1988 and having run the shandy into the ground, I still indulge in a Leine's every once in a while. Besides, they have a nice tour. Maple Dunkel pours a lovely deep copper color and is quite clear. I think I need to start pouring every beer like you're supposed to pour bottled nitro brews – turn the bottle upside down into the glass and shake like a maraca. For whatever reason, I was only able to produce a small head. The light tan foam didn't stick around very long. There were some bubbles inside. Aside from my poor pouring, it was a very beautiful bier. As I was inspecting the appearance, I could smell maple. It was somewhere between maple syrup and maple-flavored syrup although it leaned towards the latter. The aroma was sweet and overpowered the basic bier with just a tiny hit of dark malt roast coming though. At this point I was basically resigned to my fate which was going to be drinking a flavored mess. Another Snowdrift – cloying and awful. It was no surprise to taste maple. Lots and lots of maple – flavoring. It was cloyingly sweet with an overabundance of vanilla-caramel taste but lacking the woody-earthy flavors and the slight tartness that real maple syrup has. A rather muted dose of roasted grain could not penetrate the treacle while some spicy hops struggled to be tasted. That maple flavoring lingered a bit at the end until spicy/grassy hops come and add some welcome bitterness and dryness. There was no Schaumhaftvermoegen in sight. Maple Dunkel is a dreadful bier to my taste. I've had beers brewed with maple syrup and maple sap and some were good and some weren't. I can imagine a tasty dunkel that has been laced with maple flavoring – if the flavoring has been used judiciously. That's not the case here because there's no dunkel here. It's just maple flavoring. Although I will say that I liked the hops quite a bit as they were the only thing that I could taste besides maple. Junk food pairing: I kept my snacking simple with Maple Dunkel and indulged in plain old Cheez Its. I am taking a break from native Oktoberfests because it was getting to be dolorous and drinking beer shouldn't be that way. Quaffing a Märzen should be a mirthful experience, one that highlights the brief periods of joy that punctuate our time on this earth before we return to the soil. And so I look to suburban Philadelphia wherein lies Victory Brewing to address my existential ennui. My previous encounters with Victory beers were all positive and mostly very fine indeed. But I've been afflicted with a case of microbrew angst this past month or so as various other breweries with good reputations offered Oktoberfests of a less than tasteful nature. Perhaps now that our state Department of Natural Resources is run like a business, there truly is something in the air or in the water which afflicts our brewmasters, rendering them maladroit and consigning them to produce Oktoberfests which would have made Gabriel Sedlmayr cry. It is my hope that by looking to the east, to the city where John Wagner brewed the first lager on these shores (well, a suburb of that city) that I may find some hope that all is not lost. Victory Festbier pours a lovely amber and was suitably clear. While I only managed to produce only a meager head of light tan foam which went away quite quickly, the bier was rather effervescent with a fair number of bubbles inside. The aroma smelled strongly of bread, which as a good sign. But there was also a little caramel and some roasted malt scent too. It was surprised at how restrained the sweetness was here considering the bier's color. So far, so good. Things got even better upon tasting the brew. A shiver went down my spine as luscious Maillard reacted malt taste swirled and eddied on my tongue. It was a wonderful toasty flavor that had a deep vein of nuttiness as well. The malt also tasted of fresh bread along with just a hint of toffee sweetness. Peppery hops hovered in the background and paired with a healthy dose of carbonation to add crispness. For the final act, the malt faded allowing the hops to step into the limelight. They became spicier – almost minty – and gave a nice cleansing bitterness. Dry but not overly so. Schaumhaftvermoegen was limited to a few shorts streaks and the odd speck of foam. Eureka! Victory proved, well, victorious. While it may not provide a definitive answer, Festbier certainly comes down on the affirmative side when it comes to decoction mashing. Those toasty Maillard flavors run deep and full here and I just love the nutty taste to it. They are given pride of place but complemented by other malty flavors while some really tasty hops offer contrast and balance. The malt is rich instead of being watery. Sweetness bows before savory. Everything in its place. There is yet hope for Oktoberfests. Junk food pairing: Pair your Victory Festbier with some Mature Cheddar and Chive crisps, er, potato chips. They have a rich heartiness that other cheddar chips don't and thusly go very well with savory malt taste of the bier. I am getting to the point where I cannot drink anymore Oktoberfests. It has nothing to do with them being seasonal biers because they are tasty in a variety of situations throughout the year. They're not particularly big biers nor are they optimized for warmer weather with light bodies. Nor are they brewed with nutmeg, allspice, clove, and cinnamon and thusly given a narrow window of quaffing potential. The style is not tied to a harvest or a holiday and there's nothing really seasonal about them any longer since virtually no one brews them in March and pulls them from the lagering caves in September. No, I have made the mistake of investing in the Oktoberfests of my fair state and being disappointed most of the time. I have no explanation and the reason why they've been so untasty is probably reasons – they are plural. Poor shipping and storage practices may certainly be an issue. I won't deny that but nor can I prove it. But my cynic soon return and feels that most Wisconsin breweries have abandoned the state's German brewing heritage to varying degrees and so the Oktoberfest is simply a perfunctory exercise in obeisance. When you brew IPAs, sours, and potent barrel-aged potables all year, you're not getting practice at brewing lagers. 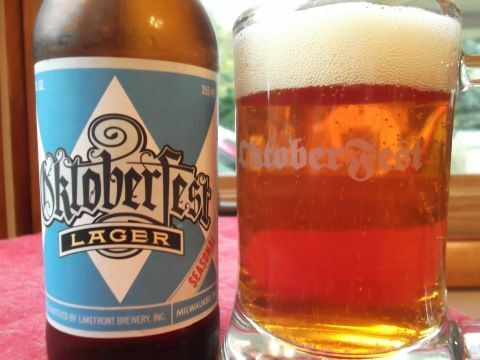 Contrariwise, some Wisconsin breweries with a fine lagery track record have produced some most unremarkable, if not awful, Oktoberfest biers this year. So there goes my lagerphobic hypothesis. Whatever the case may be, I still have lots of Oktoberfest reviews piling up which calls for another omnibus. 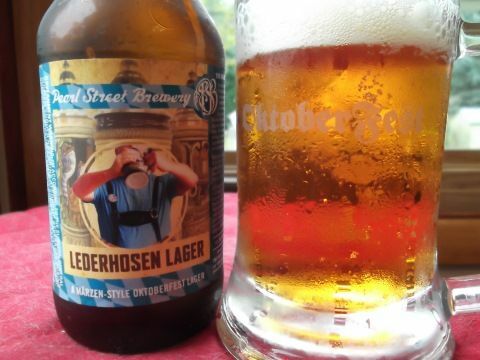 From the wilds of La Crosse comes Pearl Street's Lederhosen Lager. Pearl Street brews various and sundry German styles and has an annual pils. This is definitely not a lagerphobic brewery that genuflects to tradition once a year. So why is Lederhosen Lager so thoroughly mediocre? It was just a little over-carbonated – not a hanging offense - and under malted – a cardinal sin. It leaned to the caramel side but wasn't cloyingly sweet and let some more bready flavors come through. But all the malt tastes were subdued. I liked the spicy hops, though, and it left some of the best Schaumhaftvermoegen of the season. Lakefront knows lagers. Hell, even their pumpkin beer is a lager and it is actually brewed with pumpkins. They have a great brewery tour to boot. Sadly their Oktoberfest is par for the course as far as Wisconsin iterations go. Caramel sweetness was the dominant flavor – which I can handle - with very little bready taste – which doesn't cut the senf. I somehow managed to catch a dash of root beer in there too. And it was overly carbonated. I did like the herbal hops, though. If I may quote T.S. Eliot's typist, well now that's done and I'm glad it's over. Capital and I go way back. Their maibock was not only my first taste of a helles bock but I also lost my seasonal beer virginity with it. It was the spring of 1991 and I was blissfully unaware that beers were seasonal like Shamrock Shakes and McRibs. 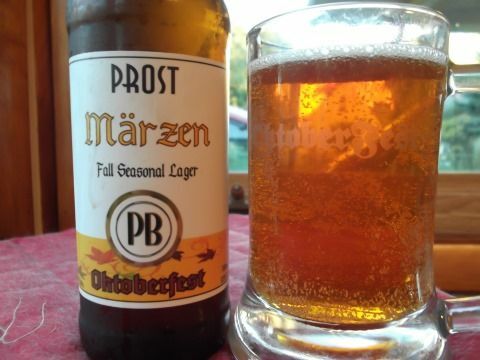 Later that year their Oktoberfest became the first Märzen to cross my lips. Capital is also likely responsible for introducing me to the concept of drinking local and was a cornerstone of my microbrew education. Having said all of this, I was not impressed by their Oktoberfest this year. It has always been a caramel-forward bier and that hasn't changed this year. But, like most of the Wisconsin Oktos I've had this year, this one lacks a bready base upon which to build a house of sweetness. It wasn't over-carbonated and I really liked the hops which were grassy and herbal but those biscuit and bread tastes were just too faint, lost like distant stars in the city streetlights. I will close with the completion of the trifecta of Oktoberfests from Green Bay featuring Stillmank. Neither Titletown nor Hinterland was able to pull through this year. And I believe it was the first time I'd had one of their beers so I was quite impressed. While there was some malty sweetness to be had, it was kept in check by a nice bready flavor. Stillmank got the proportion of malt tastes just right to my taste with bread/biscuit at the fore with sweeter malt given a supporting role. A good Oktoberfest is about getting the various malt flavors in the right spots for a grainy gestalt. Now I grant you that Stillmank didn't endow their Oktoberfest with much of that toasty/Maillard reacted goodness that I crave, but it was still a fine maltiness. And the hops. They were simply wonderful with a sprightly, fresh grassy flavor that is hard to beat. 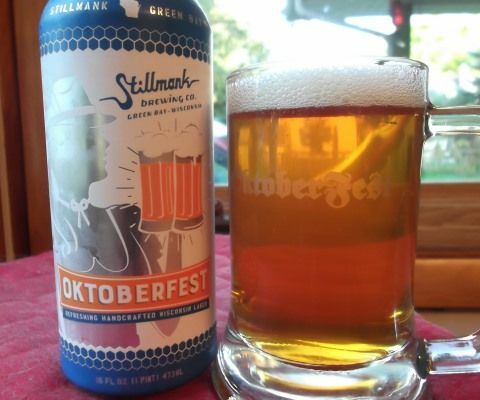 Going into this little venture last month I wouldn't have dreamt that Stillmank would not only make a great Oktoberfest but that it would probably be the best domestic (i.e. - from Wisconsin) one of the season. Truth be told, I have a couple more from Wisconsin in my cellar and I'll likely have others on tap so the title is provisional, but this will certainly go down near, if not at, the top. Good ol' Potosi. Whenever I hear the name, I think of how a friend of mine still holds it against me that I unwittingly drank his last Potosi Czech Style Pilsner one day in the dim and distant past. He still speaks of the incident in tones of thinly veiled anger. He's like liberals who still piss and moan about Ralph Nader forgetting all the while that it was the Supreme Court who crowned Dubya president. In addition to a very tasty Czech pils – there was a reason I chose it amongst the others on offer - they have a fine brewery and museum out there on the Mighty Mississip. With the vast majority of Wisconsin Oktoberfests that I've had this season ranging from almost medicore to awful, I had a goodly amount of confidence that Potosi could be different. Their Oktoberfest could be like the Battle of Guadalcanal or the Battle of Stalingrad. 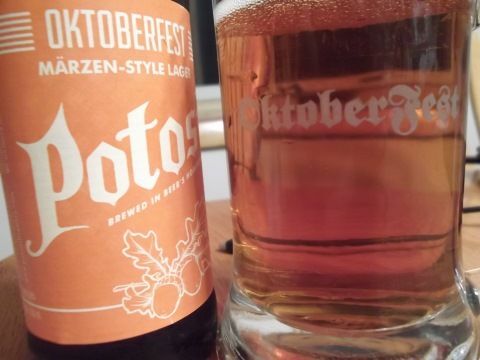 Just as those campaigns proved to be turning points in World War II, so too could Potosi's bier be the critical juncture in the search for a good Oktoberfest brewed in the Land of Cheese. I mean today's Wisconsin microbrewers are ostensibly the successors to generations of German immigrants who settled in our fair state - and their descendants too. The earliest waves of Forty-Eighters brought socialist ideas which most famously shaped Milwaukee along with other things like kindergarten. And immigrants regardless of political orientation gave us their love of sausages, strudel, and of course bier. Germans had a very large impact not only on culture here in Wisconsin but also the United States at large. Ergo it's been frustrating as a Wisconsonian of some German extraction to witness breweries of my state flounder attempting to brew on Oktoberfest that tastes as good as one that has made the trip all the way from Munich. Hell, we've even let California eat our lunch. Potosi's Oktoberfest poured a gorgeous clear copper hue. My initial pour managed only a small head that was off-white and left me wishing is Auf wiedersehen all too soon. This was my inability to pour correctly, however, as my second and more vigorous pour gave a much larger and much prettier crown of foam. There wasn't much effervescence on display. Moderately sweet caramel was first to hit my nose followed by a smidgen of roasted grain while some faint grassy hops lingered in the background. I wasn't surprised by the bouquet since the bier's color lacked the pale complexion of Oktoberfests: The Next Generation. Considering the lack of bubbles, Oktoberfest was well-carbonated by which I mean it had just the right amount of carbonation. Not particularly acidic, but just enough push back against the malt. And that malt was mostly caramel tasting with attendant sweetness. Not cloying though. It was joined by a little roasted grain and some hops which had taken on a spicy tint. Overall it had a nice medium body and a clean lager taste that was fairly crisp. The malt faded on the finish allowing the spicy hop taste to really come through. While rather bitter and a fair bit dryer than I'm used to for the style, it was still rather pleasant. My first pour of the small head produced no Schaumhaftvermoegen but my second let loose some really nice, thick streaks of foam. This was not a bad Oktoberfest but nor was it great. I liked the level of caramel sweetness here but felt it needed more roasted grain flavor to bolster the larger malt taste. This has been a common refrain here this Oktoberfest season. Most of the one's that I've had have had a very one dimensional malt taste – caramel and little else. Potosi, to its credit, adds more non-caramel malt flavor than your average bear but this bier just didn't find that Golden Malty Mean. Junk food pairing: I paired my Potosi Oktoberfest with Snyder's Zesty Ranch Pretzel Pieces to good effect.